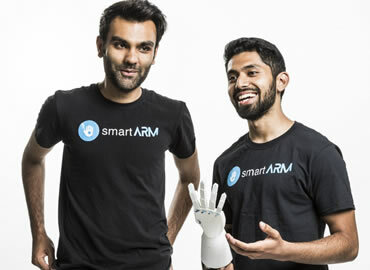 A University of Toronto student and his teammate from the University of Ontario Institute of Technology have won a global award at the "Olympics of technology," bringing home the 2018 Imagine Cup trophy for the smartARM, a prosthetic robotic hand. Samin Khan (photo right), an undergraduate student in cognitive and computer science at U of T, and Hamayal Choudhry (photo left), a UOIT mechatronics engineering student, were the winning team in Microsoft’s 16th annual innovation competition, which saw more than 40,000 student competitors register and 49 teams qualify for the Imagine Cup World Finals in Seattle, July 23-25. The team wins a mentoring session with Microsoft CEO Satya Nadella, US$85,000 in cash and a $50,000 Microsoft Azure grant to continue developing smartARM. “If you just take, for instance, your hands and your arms, you don’t often realize just how pervasive they are to your physical, everyday inter-activity with the world,” said Khan during their final pitch to the judges –Erica Brescia, co-founder and COO of Bitnami, Anil Dash, CEO of Glitch, and Peggy Johnson, executive vice-president of business development at Microsoft. A camera embedded in the prosthetic’s palm recognizes objects and calculates the necessary grip, using computer vision, machine learning and cloud storage technologies. “It doesn’t activate the grip right away – it’s waiting for a cue from a muscle sensor,” said Choudhry in the pitch, pointing to an armband worn above the elbow. “There’s an onboard computer that processes the images, and figures out the most appropriate grip,” he added. The team also described smartARM as the first “service” prosthetic, as the algorithm learns and improves with continued use, and the data is stored and can be downloaded to future prosthetic devices. Annalisa, a congenital amputee in Toronto, helped the team create the smartArm. Most prosthetics are cosmetic only, and provide little function, and robotic arms are simply cost prohibitive for the one million hand amputees globally. The team's smartARM expects to close this gap with the device costing about $100. U of T computer science team Muma, a music-matching artificial intelligence service developed during a music and AI course, also advanced to the world finals after placing second to smartARM in the Canadian finals.